President Kenyatta confident of beating NASA in the elections, claimed when he visited the Gusii land. - Bana Kenya News, Real African Network Tubanane. 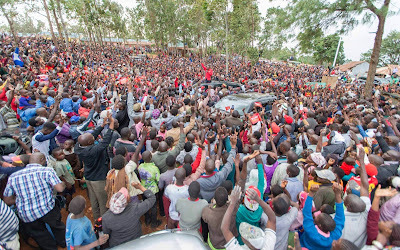 Home featured News President Kenyatta confident of beating NASA in the elections, claimed when he visited the Gusii land. President Kenyatta confident of beating NASA in the elections, claimed when he visited the Gusii land. 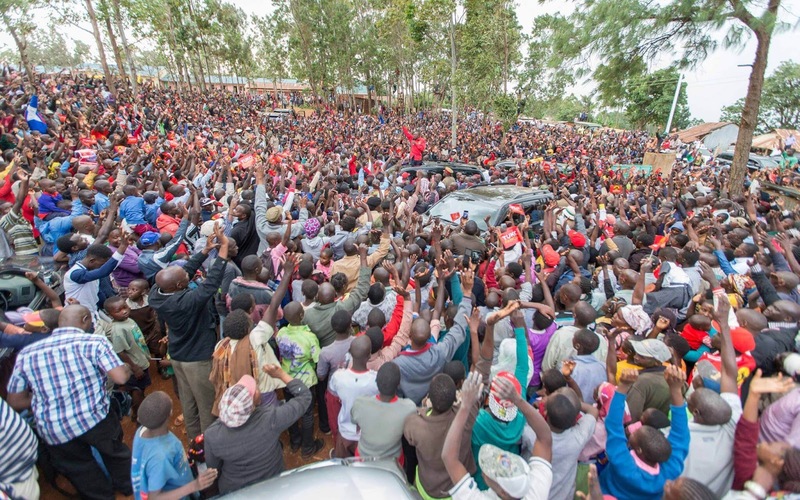 The President Uhuru Kenyatta called out for support in Kisii and some parts of South Nyanza which believed to be Jubilee stronghold. The President met the Internally displaced people in Kisii. The president gave 350 Million to the 7,000(Families) displaced people in the Gusii land. The president also promised to give them more if they vote for him in the coming elections. The Jubilee took their agenda to the Gusii land to make sure at least they penetrate to the opposition strongholds. At the same, the DP William Ruto was in Kakamega hunting for votes. The same ground where the opposition NASA was last week also attracted the DP. The government has changed their lives and has given them dignity. "It is about handing control of our lives back to us," Matundura said. "This means we don't have to rely on handouts from our children or other relatives to survive," he told the President. President Kenyatta said he agrees that the Inua Jamii program has given the elderly dignity and that is one of the reasons he wants it expanded to cover more elders. He said all elders above the age of 70 will now qualify for the cash transfers. “From next year, everyone over the age of 70 will be enrolled in the program to protect their dignity and so they can be in control of their lives,” said the President. As the President chatted with Mr. Matundura, a group of elderly people in the homestead cheered the President through song and dance in praise of the program. In 2016, the Government distributed Sh583.4 million to 24,312 elderly people under the Inua Jamii program in Kisii County alone. In Nyamira, the Government distributed Sh178.8 million to 8,461 elderly people. Empowering elder citizens through cash transfers is at the heart of President Kenyatta's campaign to enable them to continue meaningful contribution to the economy. Cash transfer beneficiaries have more than tripled to 810,000 since the President took office four years ago. Total spend on the program stood at Sh19.8 billion in the 2016/17 financial year.